Before death, what will our last words be? This is a timeless question which many of the greatest minds have, throughout the centuries, pondered. Plato is often cited for his meditation on death in his dialogue entitled “The Phaedo.” Before his impending death, Socrates tells his followers that he is not afraid because he has renounced his body in the name of his immortal soul (nous). He comes to this renunciation by way of knowledge and suggests that his knowledge (or intimation) of eternal things (ideas) proves his point; namely, that only an eternal thing (his soul) could know eternal things (ideas). His love for these eternal things inspires him to renounce his body, which he associates with fear. Socrates goes so far as to liken his last words to a swan song. His death will release from his body and it brings him joy to know he will be reunited with the source of all wisdom. In yesterday’s blog entry, I noted that Nietzsche thought of Spinoza and Kant as dishonest and misleading by virtue of the fact that they want us to believe in ideas that are antithetical to life. Nietzsche goes so far as to call their philosophy “hocus-pocus” and argues that it is unhealthy. Laughing at them, Nietzsche frees himself up for life. Adding to this, Shestov says that “all men mistrust old age.” But then he takes a turn that Nietzsche does not: “But what if all are mistaken? What if senilia bring us nearer to the truth? Perhaps the soothsaying birds of Apollo grieve in unearthly anguish for another existence; perhaps their fear is not of death but of life”(109). This possibility haunts Shestov, but it doesn’t surrender himself to it wholly. In other words, he wishes to entertain both Nietzsche and Socrates; both senilia and its sarcastic rejection. But this is not his last word. Taking an interesting tactic, Shestov turns to the distinction between the ordinary man and the philosopher and notes something very interesting. Philosophers, of course, often go against the grain of society which for them, doesn’t think. After all, philosophy – for Plato – doesn’t happen in the cave of society; it happens outside the cave, in solitude. But for Shestov the “principles” of a philosopher are no greater than that of a the everyday man because “the room of the world is infinite, and will not only contain all those who lived once and those who are yet to be born, but will give to each one of them all that he can desire”(112). Since there are a “plurality of worlds” and a “plurality of men” amongst these “vast spaces of the vast universe.” This suggests a kind of relativism. However, Shestov can’t settle for this. To be sure, he thinks that, when all the chips are down, he can understand why a philosopher – like Spinoza – would turn to creating the perfect philosophical system. Shestov calls such philosophizing “art for arts sake.” He notes that even Naploeon turned to philosophy in his last hours. What matters is the fact that he came to “philosophy with demands and would not rest until he had received satisfaction.” In the end, this brings together what interests Shestov most: the relationship of self-renunciation to megalomania. Napoleon’s turn to philosophy at the end of this life brings the two together. Even so, Shestov finds the case of Heinrich Heine to be more interesting than Napoleon. As I noted the other day, Shestov finds great insight in the fact that the German’s misunderstood Heine’s self-deprecating humor. To be sure, Heine’s last words were not senilia; they didn’t bow down to philosophy when the chips were down. Commenting on this Shestov argues that “in it, as in all Heine’s daring and provocative poems, may be heard a sharp and nervous laugh, which must be understood as the expression of the divided soul, as a mockery of himself.”(123). Heine, Shestov argues, was different from the King David whose psalms show us a man who, “when he believed, did not doubt.” For this reason, they couldn’t understand this new kind of Jew whose piety was tainted by doubt. Turning to Heine on his death bed, Shestov notes that, even then, Heine was sarcastic (his words didn’t, like Spinoza or Plato’s, become senilia): “His sarcasms every day became more ruthless, more poisonous, more refined”(125). And “his thoughts of God, his attitude to God, were so original that serious people of the outer world could only shrug their shoulders. No one every spoke thus to God, either aloud or to himself”(125). Instead of feeling fear and admiration before the thought of death, “Heine has neither prayer nor praise. 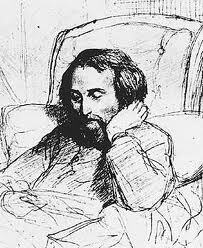 His poems are permeated with a charming and a gracious cynicism, peculiar and proper to himself alone”(125). And, according to Shestov, Heine, because of his sarcasm, “”remains as he was in youth.” He doesn’t want bliss or heaven; rather, he just wants “God to give him back his health.” This is the novelty. Given this reading, he doesn’t think the Germans should be annoyed with Heine. His “sarcasms will not keep them from their lofty aspirations.” His last words are comical but that’s the point – they are his. He – and no one else – lives with them and will die with them. Sarcasm, in other words, is not merely a matter of entertainment; for Shestov it is an existential decision. An interesting blog. But what were, according to Shestov Spinoza’s last words on death? Came here to find out Schopenhauer’s last words, left after reading the whole thing. Nice write up, though missing some conclusions!